If you fail to prepare …. prepare to fail !!! I’m told that it was the famous swimmer Mark Spitz who said that, but what would he really know about failure. It would be more believable if the saying was attributed to say, Ross Lyons, the coach of the Fremantle Dockers AFL team…… now theres a bloke who knows more about failure than even Hilary Clinton! I’d read these words on a motivation poster at Hel-expo, when we’d gone to register for Athens Half-Marathon. Although I’m only participating in the 5 kilometre race, these words of encouragement did however, stick in my mind. 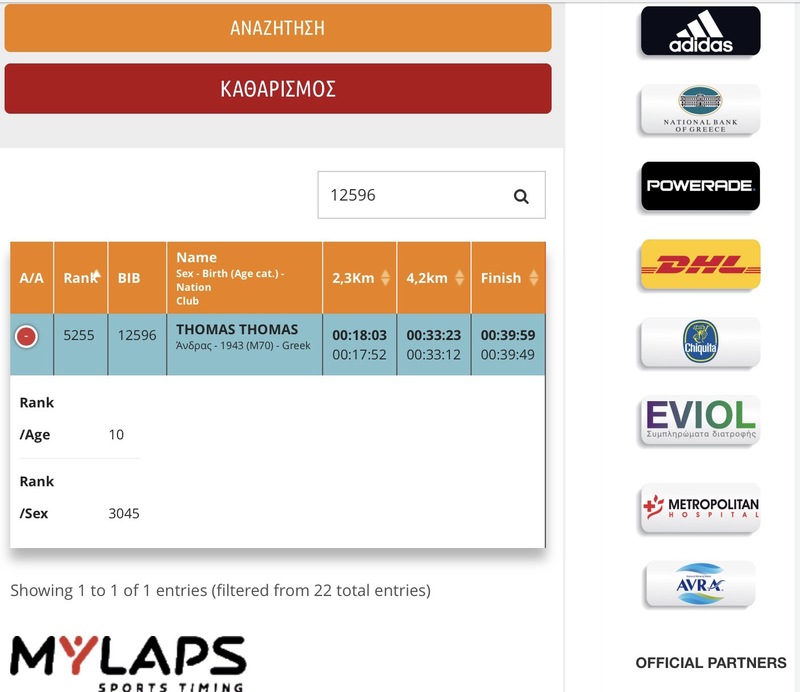 Maybe not in the way Mark intended though….. because not only had I failed to prepare ( unless you can call staying out to after midnight on the night before the race, drinking wine and Raki ) but I was also not even prepared to fail. How’s that for preparation Mark? I mean, just how difficult is it to walk and run and walk the 5 kilometres in less than 60 minutes. I do this nearly every day anyway, just by walking briskly, so it shouldn’t be too much of an ask. If you read my last post…. To Hel and back….you’d know that YM and I are staying at our Cretan landlord’s new apartment in Thiseo. And what a lovely apartment it is too. It’s a large, comfortable, stylish, modern place, two bedrooms, two bathrooms, kitchen, lounge, sun terrace and all mod cons. (Very reasonably priced as well, but for more details on the cost you’d have to contact Giannis himself) The main bathroom of the apartment has to rate a special mention….. it was really amazing. Although no bath, it did have a very large roomy shower, with three types of shower to choose from…. a rain shower, a hand held shower and the piece-de-resistance, a pressurised massage shower with its three moveable jets protruding from the wall. Whichever mode you chose, they all operated some fancy multi-coloured lights flashing from the ceiling above…. not unlike like being in a disco, but without any clothes. Oh yes, the shower also doubled as a ‘Hammam’… a Turkish steam room!!! Wow, I don’t believe I’ve been as clean as this since that time in Japan when we stayed a few nights in a mixed bathing Onsen ! Anyway, its the Saturday night before the race, and we need to go out and find a restaurant for dinner. Freshly showered ( for only the third time today!) we step outside into the street, and are overwhelmed by the many choices of places to enjoy a meal in Thiseo. 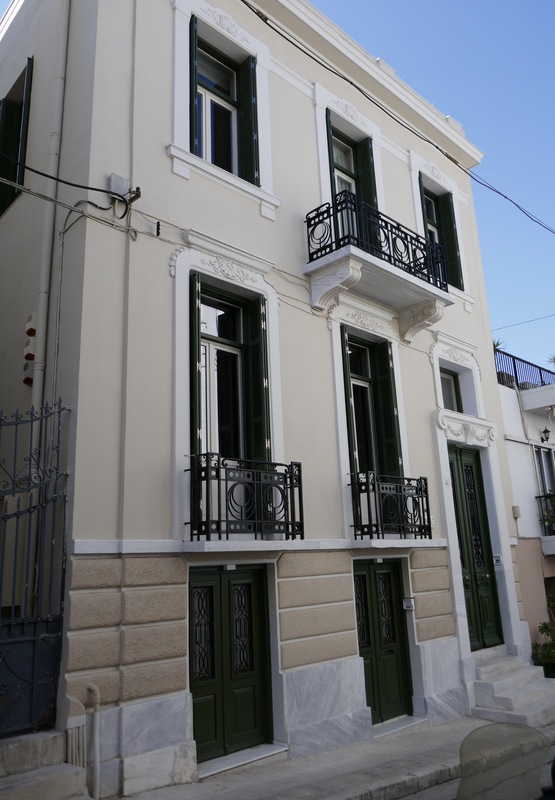 After checking out a few places nearby, and finding none that met our criteria, we walk 250 metres down the road towards the Thiseo train station, and Adrianou Street, where I knew there were plenty of other options. The very first Taverna we passed, Diavlos, had live music playing, and not only that, it was quite full as well, and by the looks of things, not tourists but locals. This will do us I told YM, and it certainly did. We snagged a table right next to the street, where we had front row seats watching the large crowds of people passing by, all out for the night. Far more interesting than watching the ‘Tele’ I can tell you. 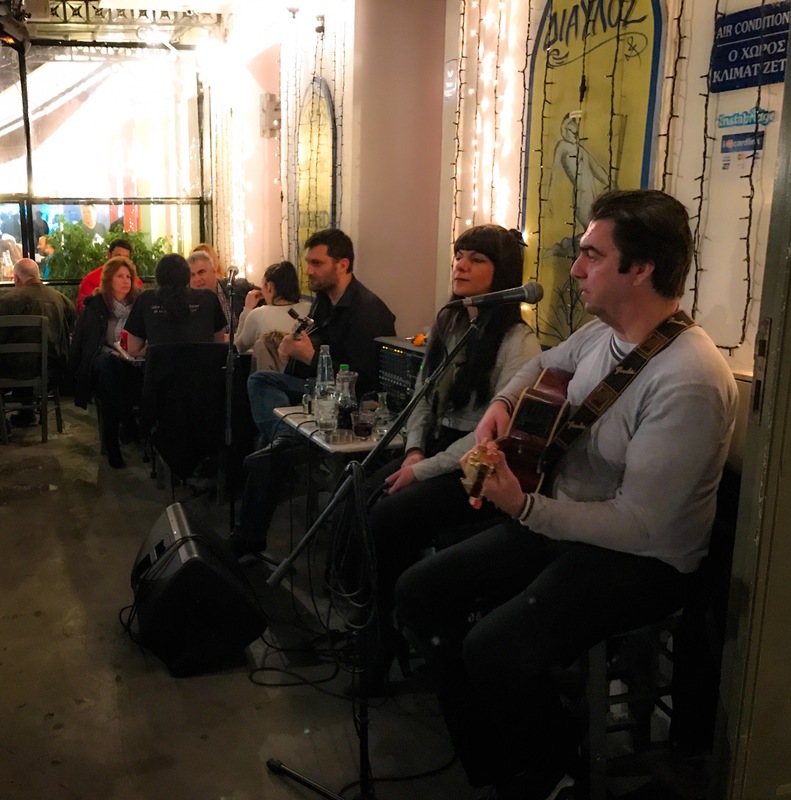 The bouzouki quartet in the corner belted out greek ‘Rembetiki’ songs all night long, and in the three hours we spent at Diavlos, they never once stopped for a break…..lets see a band in OZ do that. Food was typical of what you get in a ‘Taverna’ ( of course, its a taverna, vlakka!) and we chose the Roast Lamb and Potatoes. Yeah, and that is exactly what arrived on our plates five minutes later, a big hunk of lamb and three large potatoes. Why does it nearly always sound better on the menu when written in Greek…. ‘Archiki Mageirameno Arni me Patates sto Fourno’ ….but despite the poor presentation, it was both tasty and delicious, washed down with a nice bottle of white wine from Samos. Then, as often happens, the people at the next table ( the tables are VERY close together) struck up a conversation with us. They were two local ‘koritsia’ (girls), who were getting nicely pissed, judging by the quantity of alcohol they were consuming. I may have mentioned this before, in a previous blog-post from last year, but after you have finished your meal…. and your wine…. when calling for the bill ( or the check ) in most restaurants in Greece, you very rarely get it right away. It seems to be the custom to first bring to your table a small bottle of Raki and some ‘gliko’, some sweets, (as in ‘desert’) as a ‘gift’ of the house…… and so its also considered quite rude not to accept this show of hospitality. “ Ton logariasmo, parakalo’ ( The bill ,please) I asked Fontas, our friendly waiter. “ Amesos” was his reply, “ right away ” which of course didn’t mean ‘at once’ at all. I was also quite determined not to make too big a night of it myself, as I didn’t want to run my race tired and nursing a hangover a-la YM last year, but a small shot couldn’t be so bad could it? Luckily, the two girls at the next table had no qualms about helping me finish of the small bottle of Raki, and in fact were more than enthusiastic for the opportunity to do so. I called for the bill again, and Fontas the waiter came back, not just with the bill, but also another bottle of Raki. “Excuse me Fontas, I didn’t order this” …… “I know, the girls ordered it for you” he said. That’s another thing about Greek people, Ive always found them to be extremely generous, and they always seem to want to give you back, to return any favour you show them, with another favour. You can never win this battle of favours, as Greeks have ‘Filoxenia’ built into their DNA. ‘Filoxenia’ translates literally as ‘Friend of Foreigners’ but is meant as ‘hospitality’. With a lot of ‘Yiamas-ing ( cheers-ing) the girls and I finish off the Raki together, and already I can feel the effects beginning to show….. talking louder…. talking only in greek….singing even. 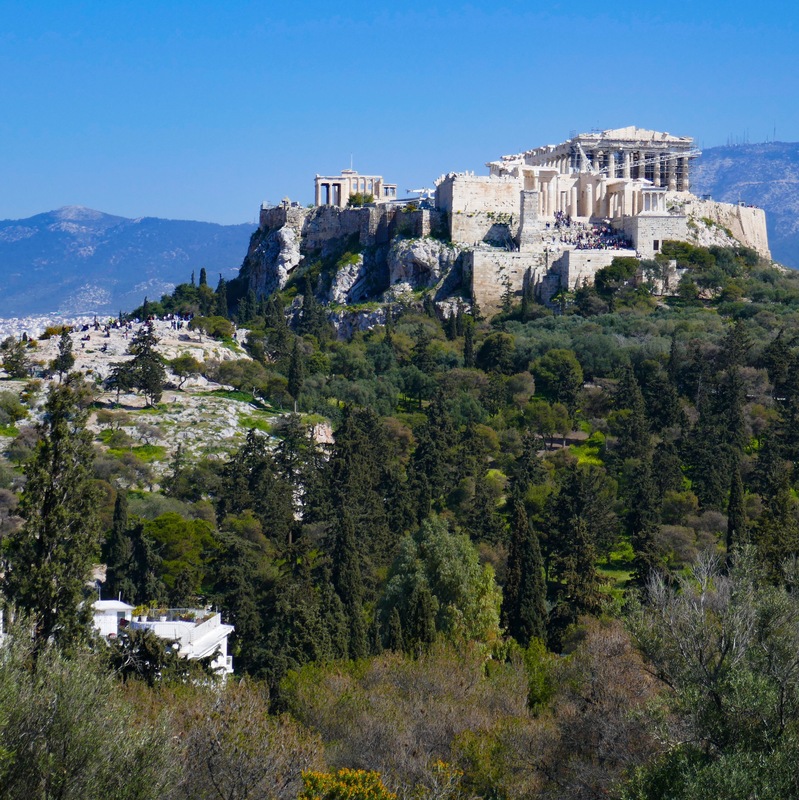 The greeks have a word for it ( they have a word for everything, they will tell you they invented language), it’s called ‘Kefi’ which although translates as ‘fun’, its actual meaning is more of a feeling you get…. like when the music so ‘moves’ you, you have the need to dance. Anyway, before the ‘kefi’ can really take a hold, at 12:30 am YM warns me to take it easy, and to remember what you have planned to do tomorrow morning. She’s right of course, it’s way past time we said goodnight to Margarita and Ioanna, my new best friends, but not before I manage to ‘outdo’ them in the Filoxenia game by buying them a small bottle of Rakomelo (its Raki and Honey) as ‘one for the road’, and then beating a hasty retreat home before they will inevitably reciprocate. Sunday morning arrives, and its a wonderful sunny spring day and I’m feeling better than I really deserve too. I’m told by YM that we need to keep our energy levels up, and so for breakfast she prepares yoghurt and banana, while I pop across the street to fetch two cups of cappuccino from the Kafeneon opposite. 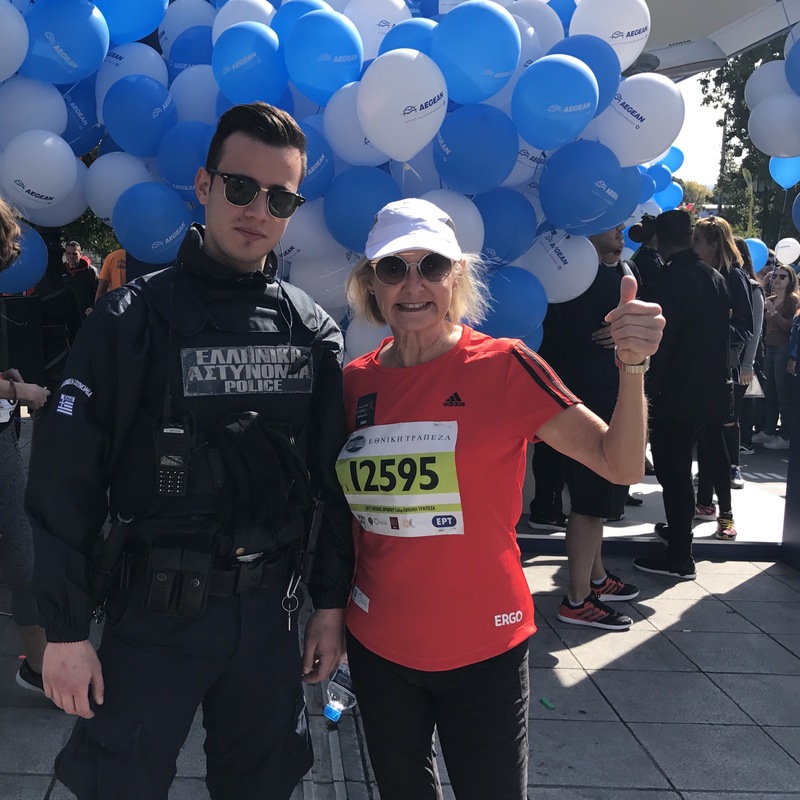 We set off at 9:30 to stroll the 20 minutes it’ll take us to reach Syntagma Square and where our event, the 5 kilometre race, will start at 10:45am. 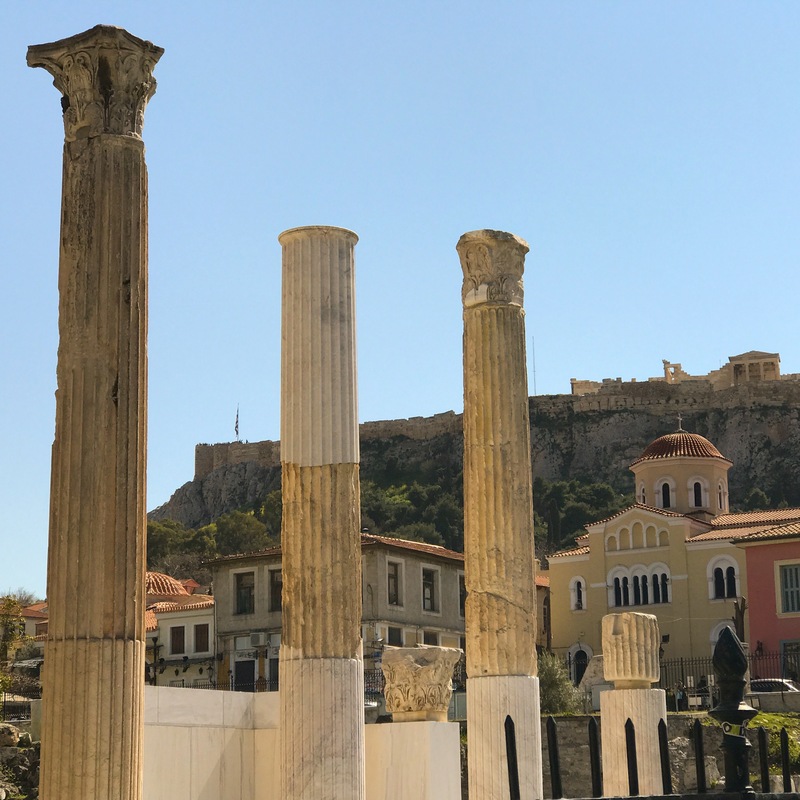 Even if you’ve never been to Athens, you’ll certainly recognise Syntagma Square in the centre of Athens. The dominant building overlooking the square is the Greek Parliament and it’s regularly in the news as the main site where all of the protest marches end up, many of them extremely violent. But not today folks, by the time we arrive the square is jam packed with a peaceful crowd. There are supposedly over 22,000 participants taking part in all the races, plus that many and more spectators. 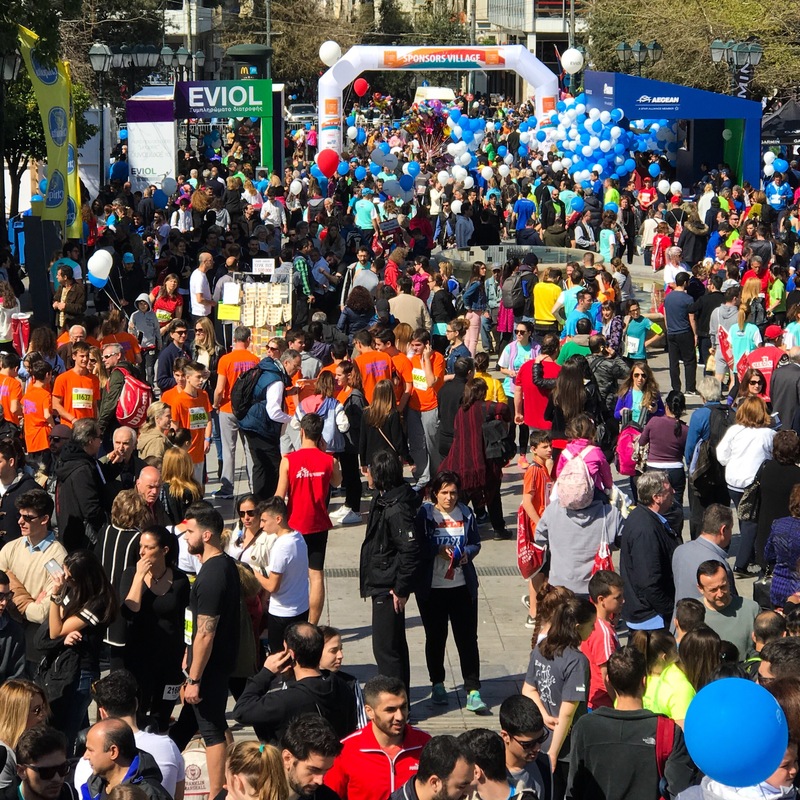 The atmosphere in the square is one of excitement and anticipation, and the Half-Marathon which started earlier, already has some of the leaders finishing, so YM and I join the crowds cheering them in. Pretty soon the organisers make an announcement for the participants for the 5k race to go to their starting positions. The announcements are only spoken in Greek, and yet, despite how quickly the announcer speaks, I still manage to get the gist of what she’s saying, and YM and make our way to the starting gate, both of us admitting to feeling quite anxious and nervous, but also very excited to be taking part. Our race Bib number says we have been allocated to start- section 3, but when we try to position ourselves in this section we are told by the officials to bugger off ( Ok, not exactly ) as the section is already full “Go to section 2 please ” ….. suits us, its closer to the front and not so crowded. A few minutes before the start gun goes off, a group of young guys near us , obviously with ‘The Kefi,’ begin to dance in a circle together to the music of Theodorakis, blaring out from the loudspeakers in the square. It’s the famous ‘Zorba’s Dance’, and who can resist dancing to that number…. its infectious. Well, YM for one certainly cant resist, and she also starts to dance to Zorba’s , but solo….. until I have to warn her to save her energy, she’s going to need it. When the starting gun goes off, over 6,000 of us take off in waves….. YM and I have already agreed not to stick together….. she is faster than me…. but to run our own race, and so within a minute of the start I’ve already lost sight of her. My strategy is to jog any downhill section, and then to just stride it out on the uphill slopes and the flat. 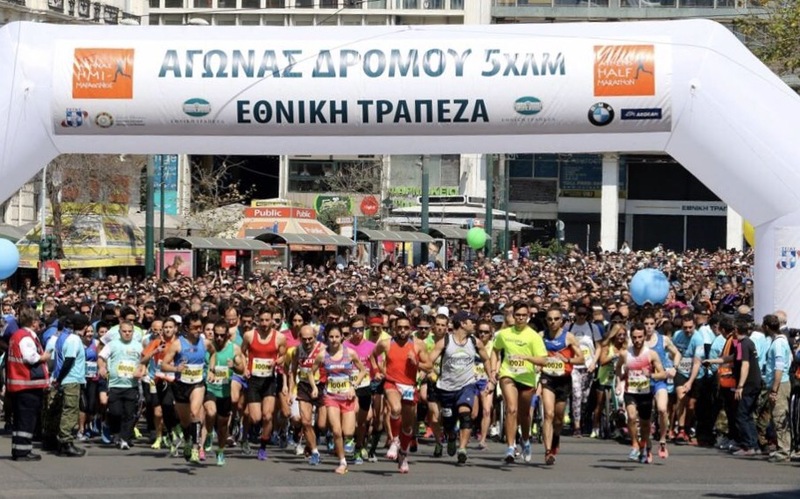 When I reach the first long uphill section on Vasileos Konstantinou Avenue, quite a few of the runners who had sprinted past me at the start, young girls mainly, are finding the going tough….. I think of the fable about the Tortoise and the Hare, and I begin to overtake many of them. To be honest, I’m really enjoying this, especially when I use a particularly attractive and shapely young lady in front of me…… she is wearing a pair of extremely tight tights, ( Tight tights? I guess they wouldn’t call them tights if they weren’t tight, would they?) ….as my pace maker. I even manage to keep up with her for about 10 minutes, but as soon as we turn left at the top of the hill into Avenue Sofias, she takes off like a dirty shirt, leaving me on the lookout for another attractive behind to follow. It really was a buzz to be running, and walking, along these streets, passing the historic buildings and monuments of this city. 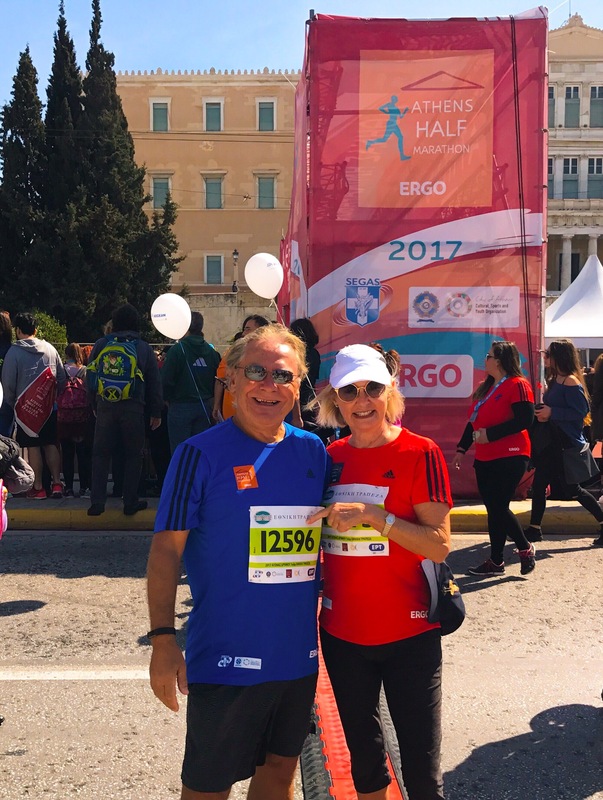 When I reached the road called Panepistimiou and saw the magnificent Academy of Athens buildings on my right, I knew I’d nearly made it to the finish, and with lots of spectators cheering and encouraging everyone along, I stepped up the pace, jogging it to the line, and crossing it like an older, shorter and fatter version of the ‘Deek’…. Robert de Castella ( Google it) . Glancing up at the stop-clock, I see that my time is 39 minutes….. what a surprise! I meet up with YM and we collect our medals. 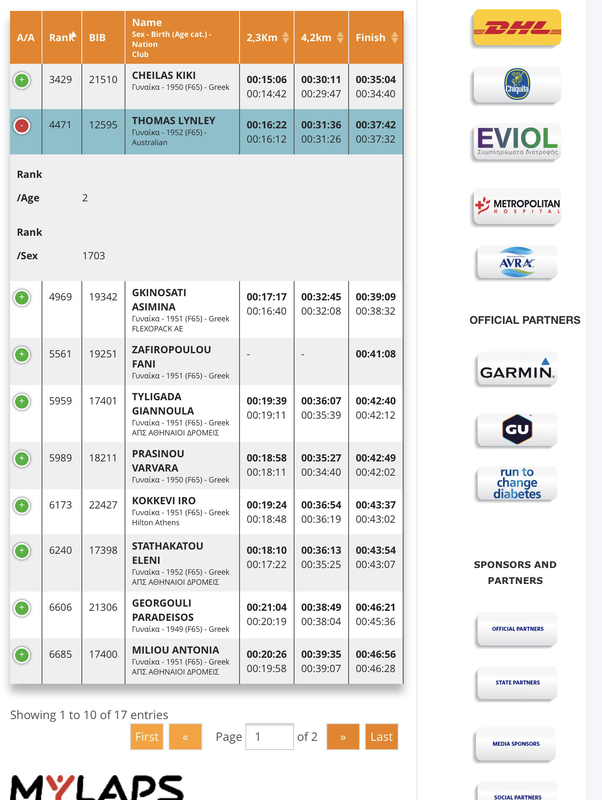 She tells me that her time was just 37 minutes, so with both of us extremely pleased with performance , naturally we do what all medal winners do….. head for the nearest taverna for a drink! 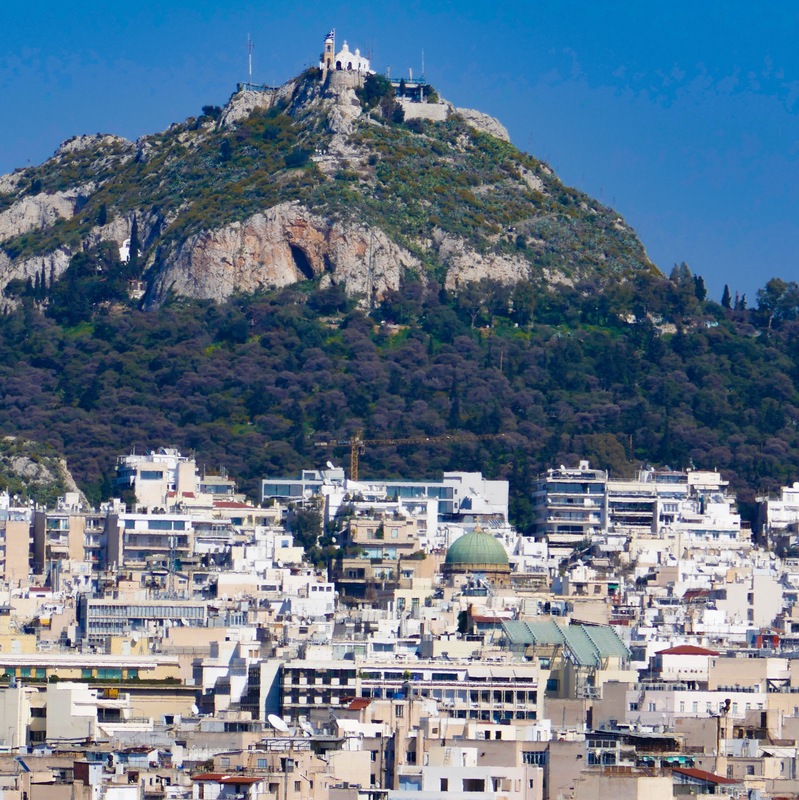 In a few hours time we’ll be leaving Athens to head back to Crete, and our home away from home in Chania. I really enjoy reading your adventurous tales. Congratulations,great experience! Loving the posts and photos! Good job the both of you. Dockers won! So they they read my blog and prepared well !! !